Haverhill, Mass. - With a majority of the local pundits already enthroning Central Catholic as a team of destiny this season, it is certainly hard to argue with that prognostication at the moment. Backed by solid pitching, and showing tremendous patients at the plate, the Raiders, ranked the No. 1 team in Eastern Mass and a clear-cut favorite to win a Super 8 championship, opened their season in fine fashion Sunday, with a convincing 13-0 rout of St. Peter-Marian at chilly Trinity Stadium. 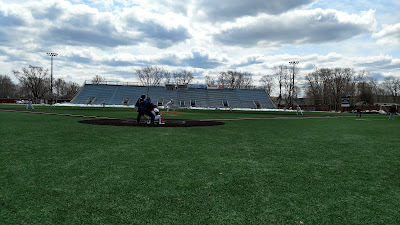 With a host of players back from last season, Central Catholic (1-0) were the benefactors of some shoddy pitching put forth by the Guardians en route to the victory. Six SPM pitchers combined to walk 15 and surrender eight hits as they fell behind by nine runs after the first two frames. "We just didn't throw strikes," said Guardians coach Ed Riley, his team falling to 0-1. "We need to figure out what we are going to do on the mound. We've got guys here with good arms but they need to have the confidence to throw strikes. Walking 15 guys is unacceptable. Obviously, the name of the game is pitching. Now its on us as coaches to try and come up with a formula to get some guys in there who can throw strikes. This is not what we expected in our first game but now we have to make some adjustments moving forward." The Raiders, who reached the Super 8 tournament for the first time a year ago, jumped on SPM starter Carter Liston for five runs in the opening inning as the senior right-hander struggled with his command. Central Catholic would load the bases with none out before a walk to Dominic Keegan brought home the first run. A ground out plated another. That was soon followed by Steven Hajjar's two-run triple to center field making it 4-0. Moments later, Hajjar trotted home on a double off the bat of Noah Lucier. Hajjar, a University of Michigan commit next season, finished 3 for 4 at the plate. "We have a lot of confidence with our hitting and our defense too," Hajjar said. "We feel our lineup is very strong. I think this whole team is ready to go and I'm just excited about the season. I think we have the weapons to get back to the Super 8. Opposing pitchers are going to have to be good if they want to go up against us." Uncharacteristic for them, SPM pitchers issued nine walks over the first two innings, thus leaving Riley to make consistent trips out to the mound in an effort to settle his pitchers down. With reliever Ryan Adams opening the second for the Guardians, the results remained the same. Walks to Joseph Sanchez and Michael Pierro set the stage for Keegan's ground-rule double which plated Sanchez. A wild pitch brought Pierro in, and Michael Borrelli next walked thus putting an end to Adams' time on the bump. With Ben Landry now on in relief, the junior began by walking Hajjar to fill the bases. A Patrick Casserly SAC fly scored Keegan, and a walk to Lucier loaded the bases yet again. Adding to the misery, Landry uncorked a wild pitch that plated Borrelli, putting the Raiders on top by nine runs. Landry's day would come to a close after he surrendered a one out walk to Pierro in the bottom half of the third. Jack Maynard was brought in and immediately issued a base on balls to Keegan. After both runners moved up a base following a passed ball, Borrelli followed by lifting a fly ball to center that allowed Pierro to race home from third. Following another wild pitch which moved Keegan over to third, the senior crossed the plate shortly thereafter on Hajjar's line single up the middle. Meanwhile, Central Catholic's pitching continued to make life difficult for the Guardians. Starter Nate Carpenter limited SPM to just one hit over his four innings of work. The senior righty struck out four and walked one. "Nate is so composed out there and keeps the ball below the knee all the time," said Raiders coach Marc Pelletier, beginning his 31st season. "St. Peter's had some trouble today on the mound but it is their first game of the year as well. They are going to be just fine. They'll be a different team next time out. For us, we didn't leave guys on base today. We were able to bang guys in. All in all it was a good day." Relievers Aidan Abernathy and Jonathan Montanile followed up Carpenter's strong outing by combining to allow just one hit while striking out five the rest of the way. The Raiders offense continued to click, tacking on solo runs in the fourth and fifth innings, respectively. In the fourth, Central Catholic had runners on second and third. A Maynard wild pitch push the advantage to 12-0. In the fifth, Hajjar led off with a double against new relief pitcher Bryan Crue. After retiring the next two batters, Crue lost his control after dealing three consecutive walks, leading to Central Catholic's 13th run. "Our goal is to go out and attack the other team," Hajjar said. "It is not a situation where we are going to wait around for them to come after us. It is more about us going after them."